Home is not only where the heart is; for many, it’s also where hope for the future begins. This is certainly true for Damon Hininger, the quintessential “local boy done good” of Leavenworth, Kansas, for whom long-term dreams have become hard-earned realities. From his humble beginnings in a blue collar town, Hininger, 39, was appointed in July as president and chief operating officer of Corrections Corporation of America (CCA), the private company that operates prisons, jails and detention centers for federal, state and local government in about 20 states. “It is possible to go from a CO to a COO,” Hininger says. Hininger’s story of rising through the ranks from joining CCA as an entry-level correctional officer might sound like a tall tale to some, but for his cheerleaders – friends, family and a national network of colleagues – it’s proof positive that with dedication and hard work, employees can go anywhere and become anything. In August, Hininger returned to the place where he launched his career 16 years ago – Leavenworth Detention Center. In his role, Hininger, the son of a working mother and a father who owned a motorcycle dealership, now helps oversee a work force of nearly 17,000 and operations in more than 65 facilities from coast to coast. Negotiating contracts, developing business, ensuring adherence to detailed contractual mandates, maintaining workplace morale and more are all in his day’s work. While he may be in his office or boarding a plane shortly after the break of dawn and concluding his work as dusk beckons, Hininger has struck a balance that has come to define his personable brand of professionalism. He’s regarded as a type of leader who has a knack for remembering everyone’s name, and he hasn’t strayed far from the advice of his parents and the stories of his neighbors who worked at the nearby Kansas State Penitentiary. After his graduation from Kansas State University in 1991, Hininger’s parents recommended he apply to be a corrections officer at Leavenworth Detention Center, just as the facility was being built. “The reputation of the industry and of CCA is what prompted my parents to tell me to look into a career with the company when I graduated from college and didn’t really know what I wanted to do,” he says. In the final weeks before the facility opened, Hininger spent long days mopping floors, unloading trucks filled with mattresses and pillows, and removing construction debris from housing units – tasks not far removed from the very duties that defined his summers as a teenager, when he worked with his father. When inmates arrived at Leavenworth, Hininger began on the midnight shift, later served as warehouse manager and helped transport inmates to the federal courthouse in Kansas City. After two years at Leavenworth, he transferred to the Central Arizona Detention Center as training manager. He joined CCA’s Nashville-based corporate headquarters, in 1995 after having been named the companywide Employee of the Year. Since then he has served as vice president of business analysis, director of strategic planning, director of proposal development, and senior vice president of federal and local customer relations. 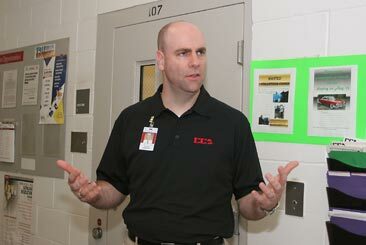 As think tanks and various reports project an inmate population that will continue to climb, Hininger believes that corrections presents a secure and satisfying career path that should especially appeal to the X and Y generation, who are being confronted with the promises and pressures of a new global economy.